The other day on Instagram, Miss Jora posted an image of a bowl of festive pomegranates from her yard (yes, her yard!!). 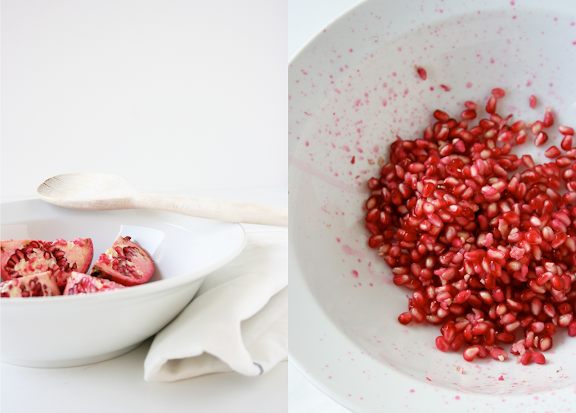 I immediately decided I had to share this post with you on seeding a pomegranate without making a mess. It's seriously the best method I've ever used (and I'm fairly certain I've tried them all), and only takes about 3 minutes to complete. So, if you're lucky enough to have a pomegranate tree in your back yard, or simply pick them up at the grocery store, this post on how to seed a pomegranate is for you. Pomegranate seeds make the perfect garnish for a chilled fresh fruit salad, many savory meat dishes and chocolate cake. Here's to a beautiful and delicious beginning to this year's holiday season! Thanks for sharing! Lovin' the pics!